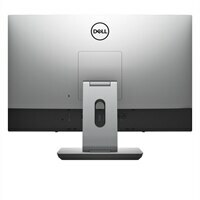 Dell OptiPlex 7760 All-in-One Articulating StandThe Dell™ OptiPlex 7760 All-in-One Articulating Stand maximizes productivity and comfort in the workplace for users of the OptiPlex 7760 All-in-One system. With the ability to both tilt your monitor forwards and backwards and lower it on the desk to a 60 degree angle, you can ensure a comfortable and productive workspace. Maximize your productivity and work in the most comfortable settings to meet your personal needs with the Dell OptiPlex 7760 All-in-One Articulating Stand. Built for the OptiPlex 7760 All-in-One system, this adjustable stand allows you to tilt from 30 degrees back to -5 degrees forward. It also fully reclines to a 60 degree angle making it perfect for workspaces where the Touch screen is utilized. The Dell™ OptiPlex 7760 All-in-One Articulating Stand maximizes productivity and comfort in the workplace for users of the OptiPlex 7760 All-in-One system. With the ability to both tilt your monitor forwards and backwards and lower it on the desk to a 60 degree angle, you can ensure a comfortable and productive workspace.